The intent of this White Paper is to provide an understanding of MTBF and other product reliability methods. Understanding the methods for the lifecycle prediction for a product enables the customer to consider the tangible value of the product beyond set-features before purchasing it. MTBF, MTTR, MTTF and FIT are reliability terms based on methods and procedures for product lifecycle predictions. Customers must often include reliability data when specifying what product to buy for their application. MTBF (Mean Time Between Failure), MTTR (Mean Time To Repair), MTTF (Mean Time To Failure) and FIT (Failure In Time) are ways of providing a numeric value based on a compilation of data to quantify a failure rate and the resulting time of expected performance. The numeric value can be expressed using any measure of time, but hours is the most common unit in practice. Product purchasing decisions should not be based on feature sets alone. You should also consider the product’s life expectancy. Understanding the methods used to predict a product life cycle will help you make informed decisions. Mean Time Between Failure (MTBF) is the number of failures per million hours for a product. 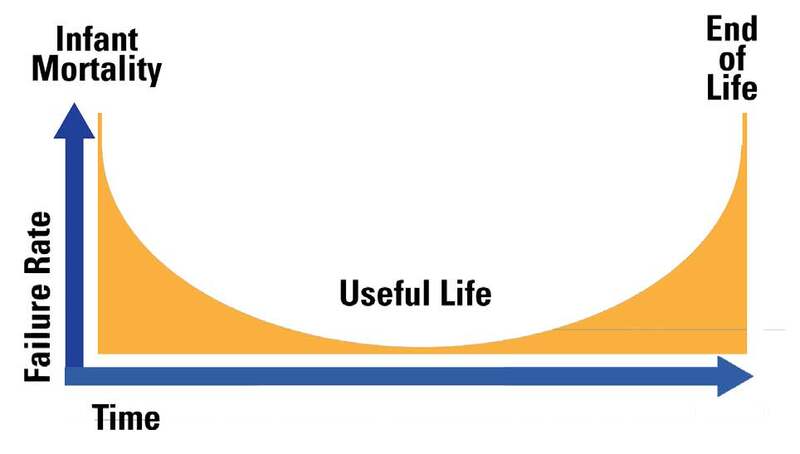 This is the most common parameter used to predict a product’s life span. Industries and integrators tend to pay close attention to MTBF, but consumers are often price driven. They may not realize that a product with a short lifespan really is not much of a bargain. MTBF data is not always readily available but, it is worth asking for the information. MTBF data should be a required line item in a request-for-quote (RFQ). If this data is not provided, a manufacturer’s piece of equipment should be immediately disqualified. Mean Time To Repair (MTTR) is the mean time needed to repair a failed hardware module. The actual installation time is only part of the story. The time required to acquire the new part is also a factor. Down-time costs money. Mean Time To Failure (MTTF) is a measure of reliability for nonrepairable systems. It is the mean time expected until the piece of equipment fails and needs to be replaced. MTTF is a statistical value and is calculated as the mean over a long period of time and a large number of units. MTBF should be used in reference to repairable items, while MTTF should be used for non-repairable items. However, MTBF is commonly used for both repairable and non-repairable items. Failure In Time (FIT) is another way of reporting MTBF. FIT reports the number of expected failures per one billion hours of operation for a device. This term is very important in the semiconductor industry, but is also used by component manufacturers. FIT can be quantified in a number of ways. Examples include: 1000 devices for 1 million hours, 1 million devices for 1000 hours each, and other similar combinations. FIT and Confidence Limits (CL) are often provided together. In common usage, a claim to 95% confidence in something is normally taken as indicating virtual certainty. In statistics, a claim to 95% confidence simply means that the researcher has seen something occur that only happens one time in twenty, or less. For example, component manufacturers will take a small sampling of a component, test for x number of hours, and then determine if there were any failures in the test bed. The CL will be based on the number of failures that occurred. The MTBF is often calculated based on an algorithm that factors in all of a product’s components to reach the sum life cycle in hours. This calculation assumes that the product was properly packaged when delivered, that it was installed correctly, and that the customer is not doing anything to damage the product after it has been deployed. A product with an extremely high MTBF may not necessarily have an equally impressive service life, depending upon how it is being treated. MTBF is more than a simple formula. A person certified and educated in calculating MTBF must review the MTBF for every component, as well as other factors like operating temperature range and storage temperature range. In addition to the MTBF calculation, quality assurance managers should track all reported field failures as well as the root causes. Combining all of this data should produce a more accurate prediction of a product’s service life. Since this process takes time, calculating the MTBF and other predictions of reliability is an ongoing process. MTBF can be subject to change. For example, RoHS “(Restriction of Hazardous Substances”) was mandated by the European Community in 2006. If a released product is re-developed in order to meet RoHS compliance, the entire calculation has to be performed again. New, RoHS-compliant components may have a different life cycle than the parts that they replace. ISO-9001 Certification is an indication that the manufacturer has calculated the MTBF accurately. ISO certified companies have committed themselves to meet the goals of “continual improvement” and “zero defects”. That means that a product will be rigorously tested in numerous ways, including submissions to outside labs for the appropriate certifications. The product is far more likely to be as flawless and as functional as advertised. Reliability methods such as MTTR, MTTF and FIT apply to products or to specific components. However, MTBF remains the basic measure of a system’s reliability for most products. The true value of MTBF calculations is often debated, sometimes called irrelevant and often misunderstood. But, it is still a very useful tool when evaluating a product purchase. Always ask for an MTBF value, always find out how current that information is and always find out what standards it is based upon. That will help you choose wisely, and to select the appropriate product for your application. Numerous prediction methods have been developed to determine reliability. For example, the most common standards for media converters are the MIL-HDBK- 217F Notice 2 (Military Handbook published by the Department of Defense) and the Bellcore TR332, (used by most commercial electronic product companies). The MIL-HDBK- 217F Notice 2 predicts reliability with two methods: Parts Count Prediction (used to predict the reliability of a product in its early development cycle) and Parts Stress Analysis Prediction (used later in the development cycle, as the product nears production). Bellcore TR332 uses the MIL-HDBK- 217F Notice 2 as a starting point, but modifies – and simplifies – the models to better reflect Bellcore’s field experience.